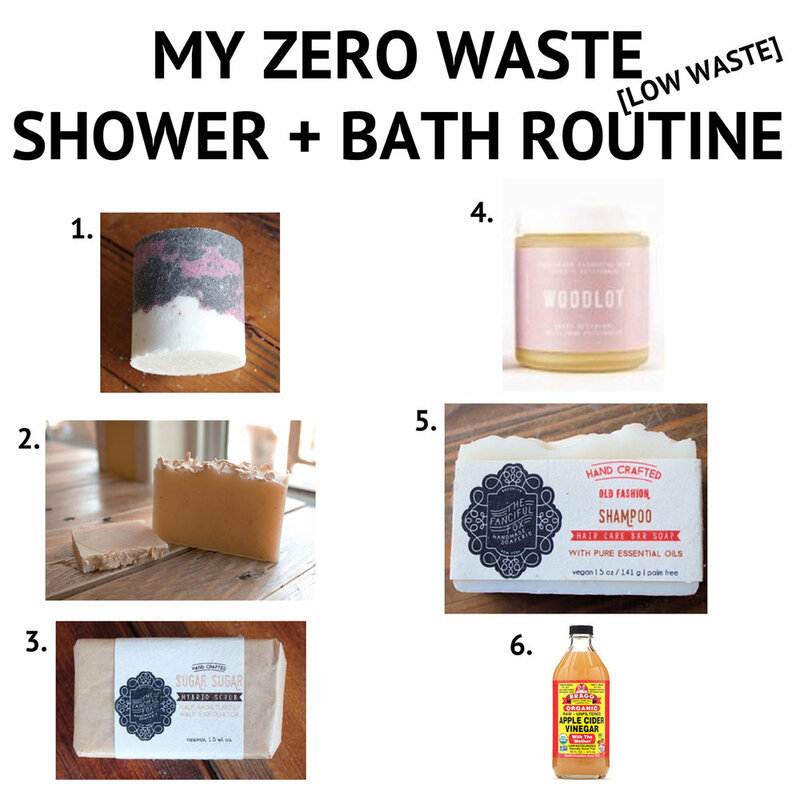 I don’t believe that “zero waste” is about perfection; it’s about being intentional and doing your best to limit your unnecessary waste. Look for options that: 1. Have little to no package 2. Have glass packaging that you can reuse after you finish the product 3. That you can buy locally to avoid additional shipping and packaging materials [or products that are shipped in recycled or eco-friendly materials]. *All bodies, hair types, and skin types are different, so these might not work for you, but I hope they inspire you to think about your impact… especially in terms of waste. BATH FIZZ- $4 // If you’re like me, you love a good relaxing bath. They’re one of my favorite forms of self care. While showers are more eco-friendly, if you are going to opt for a bath… make it a special one! I love adding a bath bomb or bath fizz for some extra relaxation and nourishment. The one linked from Fanciful Fox has clean ingredients, is 100% vegan [and made by vegans], and feels like a dream on your skin. These bath fizzes are also packaged in paper making them a low waste option. OATMEAL VEGAN SOAP- $4.25 // I prefer buying bar soap to avoid bottle packaging . I recently started using the oatmeal vegan soap from Naked Vegan Soap [linked]. The soap comes wrapped in paper, and the company is run by owners of the Trew Love Rescue + Sanctuary and proceeds from each sale gives back to the animal sanctuary! SUGAR SUGAR BAR SCRUB- $5 // This sugar sugar bar soap is half exfoliator half moisturizer and perfect for my skin in the winter. It’s extremely exfoliating but leaves your skin feeling completely moisturized and nourished. Plus, it comes packaged in paper, making it another great low waste option. CLEANSING BALM- $39 // This cleansing balm is the most expensive item on this list, but it’s truly amazing. If you have dry skin [I do, so it’s the only perspective I can speak from], it’s extremely nourishing and leaves my skin feeling hydrated and plump after washing [none of that tight, dry feeling after cleansing with this!]. I do a double cleanse [wash your face twice] with this cleansing balm, and you only need a pea sized amount. It takes off all my make up, including water proof mascara, eliminating the need for an additional make up remover. It comes in a glass container, which I reuse for storage after finishing the product [takes months to go thru!]. The jar does come in a paper box… just make sure to recycle that! SHAMPOO BAR SOAP- $7// Switching to a shampoo bar has been a journey for me. I’ve tried multiples, but the journey has been worth it to find a great option that’s low waste. I love the bar from Fanciful Fox. It’s not too striping and doesn’t leave my hair greasy. It’s the perfect formula for my fine, dry hair that usually gets greasy quickly. It comes wrapped in paper. APPLE CIDER VINEGAR- $4.09 // Apple cider vinegar might be the oddest member on this list, but it makes a huge difference when using bar shampoo. I mix 2 parts water to one part apple cider vinegar, put it in a spray bottle [I reused an empty hydrosol facial mist spray bottle!]. After shampooing, spray some of the apple cider vinegar thru your hair, massage it in, let it sit for a minute or two, and then rinse out. It leaves your hair feeling silky smooth. The apple cider vinegar comes in a glass bottle, which you can reuse after finishing the product [which lasts a long time], and having apple cider vinegar around the house comes in handy for a variety of reasons [cooking, cleaning, cleansing, etc]. At home I store all of these items in reusable close-able tins or reused glass jars. And for travel, I transport them in our RMG collaboration ‘Moon Child’ Cosmetic Case . This case is made out of upcycled NYC billboards, a durable vinyl material that is strong, sturdy, and water resistant [which is key for traveling with toiletries].